1. 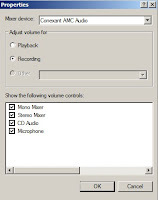 Open up your volume control from the corner of taskbar. 2. It will pop up a dialog box something like this. 3. Goto "options" -> "Properties" -> select "recording" radio button. 5. Select checkbox either on the stereo mixer or mono mixer depend on your own choice. 7. Start press record on your program. 8. While recording, start your video which you want to save only the sound of that video. 9. After finish recording, stop your recording from your recording program. 10. That's it.... It's not very hard..